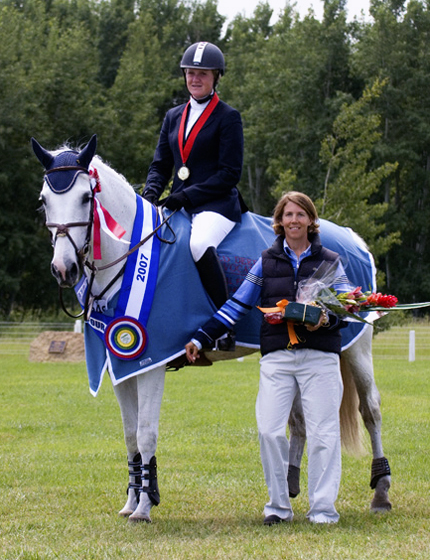 Shadowbrook Stables is located in Moorpark, California, and was founded by Jeni Brown in 1998. Jeni is the owner and trainer and is assisted by Emma Lindstrom. Shadowbrook has riders and horses of all ages and levels who compete in the hunter, jumper, and equitation divisions at shows all over the West Coast. Shadowbrook is a friendly place where horse owners can share and participate in all aspects of riding and horsemanship. Everyone there has a true passion for the sport and a love of the horses. The care of the horses and their well being is paramount and the riders are assisted in their development in a positive and supportive atmosphere. Success in the show ring is measured by improvement of horse and rider and achieving personal goals, as well as the ribbons. Jeni and Emma feel so fortunate to have horses in their lives and truly enjoy sharing their abilities and knowledge with all of the wonderful people and horses at Shadowbrook.